A Dynamic Mechanical Analyzer is used to measure mechanical and viscoelastic properties of materials. The unparalleled versatility of the DMA 1 allows applications to be performed in the optimum measurement configuration. 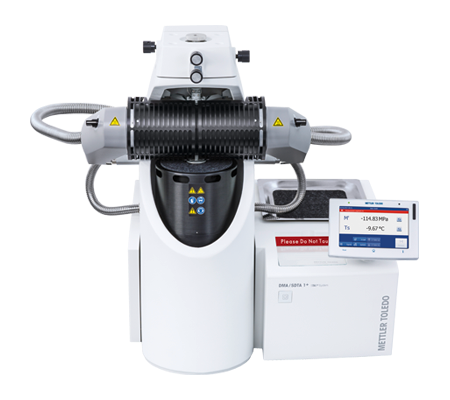 The DMA 1 is easy to set up, whether for conventional DMA analyses, experiments using static forces or measurements in liquids. Dynamic mechanical analysis (DMA) is an important technique used to measure the mechanical and viscoelastic properties of materials such as thermoplastics, thermosets, elastomers, ceramics and metals. In a Dynamic Mechanical Analyzer, the sample is subjected to a periodic stress in one of several different modes of deformation. The force and displacement amplitudes and phase shift are analyzed as a function of temperature, time and frequency. The operating principles of the DMA/SDTA are in many respects very different to those of the current generation of conventional DMA instruments. The massively built stand results in the system having an intrinsic resonance frequency of about 1500 Hz, well above the measurement frequencies used. The sample itself is fixed directly to the force sensor so the force actually applied to the sample is measured. This technique was developed at the Institute of Dynamic Material Testing, University of Ulm, Germany, where it has been in successful use for several years and has undergone continuous development. The modulus is calculated from the ratio of force to displacement multiplied by a geometry factor given by the sample dimensions. The modulus can be determined with great accuracy because both force and displacement are measured. The fixed and moving parts can be adjusted via a three-dimensional alignment device so that the force is applied at an angle of exactly 90° to the sample and no errors due to transverse forces occur. The unparalleled versatility of the DMA allows applications to be performed in the optimum measurement configuration. The DMA is quick and easy to set up, whether for conventional DMA analyses, experiments using static forces or measurements in liquids. The Humidity option consists of a special humidity chamber, a circulating heating bath and a humidity generator. It allows you to perform measurements under optimum conditions in every deformation mode. Special readjustment is not necessary after installing the humidity chamber. Besides the dynamic mode, the DMA permits measurements to be per- formed using static forces (TMA mode). All the deformation modes avail- able for DMA can be used. The Fluid Bath option allows you to perform DMA or TMA experiments in liquids using all the standard deformation modes. The entire sample holder and sample is immersed in the liquid. The Fluid Bath option consists of a special immersion bath and external temperature control using a circulating heating bath or chiller. DMA is an important technique used to measure the mechanical and viscoelastic properties of materials such as thermoplastics, thermosets, elastomers, ceramics and metals. In DMA, the sample is subjected to a periodic stress in one of several different modes of deformation (bending, tension, shear and compression). Modulus as a function of time or temperature is measured and provides information on phase transitions. DMA technology is the perfect solution when maximum accuracy is required and the material has to be characterized over a wide range of stiffness and/or frequency. In addition, DMA technology is extremely versatile and therefore, DMA can characterize materials even in liquids or at specific relative humidity levels. The frequency range has been extended to the kHz region for the first time ever in a DMA instrument. In the shear mode, six decades are available. 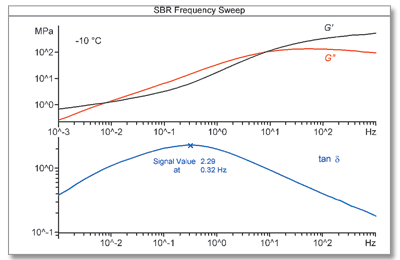 The region above 1 Hz is particularly interesting because it means that measuring times can be kept to a minimum. The Measuring Head can be placed in the most convenient position for mounting sample holders and clamping samples. Afterward, it is set to the optimum position for measurement in the particular deformation mode. The orientation of the Measuring Head is automatically detected. It monitors the sinusoidal excitation function. Measurements with static forces - besides the dynamic mode, the DMA 1 permits measurements to be performed using static forces (TMA mode). All the deformation modes available for DMA can be used.